Easy Setup is the function of TM-Intelligent printer to support easy deployment. 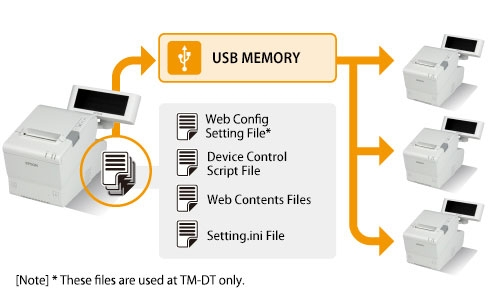 Using Easy Setup, the setting data of TMNet WebConfig is easily transferred to another TM-Intelligent printer through a USB memory device. (1) Setting up a TM-Intelligent printer by using TMNet WebConfig; then storing the setting data in the local PC. (2) Editing the "Setting.ini" file with a text editor application, e.g. Notepad. (3) Copying the setting data to a USB memory device. (4) Connecting the USB memory device to the target TM-Intelligent printer to set up. (5) Turning on the power at the target TM-Intelligent printer after installing roll paper. (6) The setting data is automatically copied to the target TM-Intelligent printer. Then the setting information is printed out on the roll paper. When other TM printers are connected to the target TM-Intelligent printer through the Ethernet or Wi-Fi network, the setting data for the TM printers can be transferred to the target TM printers, too. For more details, please refer to the "Easy setup guide" manual, which can be downloaded at the Download page for TM-i printer or the Download page for TM-DT printer.